Greetings from Ekaakshara e-Magazine. Wish you and your family a Happy New Year ! We are happy to inform you that Conference Asia has chosen Ekaakshara as their media partner for their annual mega event, HR Excellence Forum 2015. With the huge success of HR Excellence Forum 2014, Mumbai and in continuation with their endeavor, Conference Asia is organizing the “2nd Annual HR Excellence Forum & Awards 2015”, scheduled on the 05th & 06th February 2015, Mumbai. The “2nd Annual HR Excellence Forum & Awards 2015” will gather more than 150+ HR thought leaders & senior decision makers from across sectors pan India. The event is supported by our Strategic Advisor – BMGI, Delegate Kit Partner – InHelm Partners, HR Magazine Partner – People and Management & Ekaakshara, B2B Partner – LINKSME and Community Partner – CiteHr to name a few. The HR Awards 2015 aims at recognizing and celebrating the collaborative efforts of individuals & their teams in their journey towards HR Excellence through innovation, dedication & commitment, thereby making it the most sought after awards for the HR fraternity. This is a step in representing the best initiatives of individuals, their teams and organizations across these 12 Awards categories. 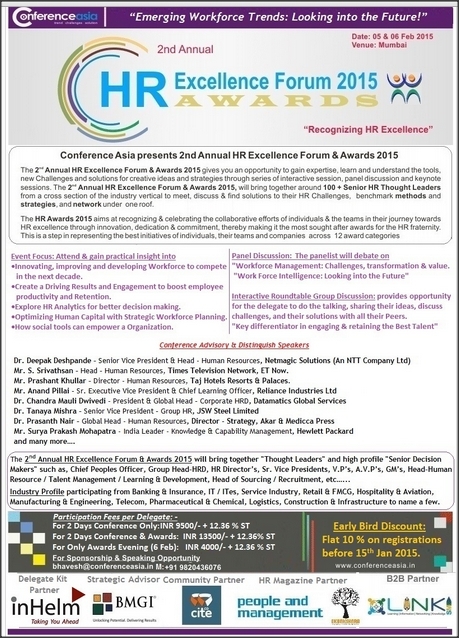 Kindly find below the details for the “2nd Annual HR Excellence Forum & Awards 2015” scheduled on the 05th & 06th February 2015, Mumbai for your ready reference. Request you to kindly consider the same with regards to participation from your esteemed organization. (Limited Sponsorship Opportunities Available).